Originally a Dutch colony in the 17th century, by 1815 Guyana had become a British possession. The abolition of slavery led to black settlement of urban areas and the importation of indentured servants from India to work the sugar plantations. This ethnocultural divide has persisted and has led to turbulent politics. 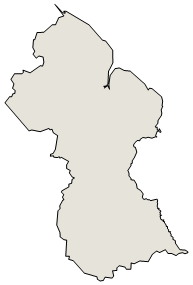 Guyana achieved independence from the UK in 1966, and since then it has been ruled mostly by socialist-oriented governments. In 1992, Cheddi JAGAN was elected president in what is considered the country's first free and fair election since independence. After his death five years later, his wife, Janet JAGAN, became president but resigned in 1999 due to poor health. Her successor, Bharrat JAGDEO, was reelected in 2001 and again in 2006. Guyana Action Party or GAP [Paul HARDY]; Justice for All Party [C.N. name: "Dear Land of Guyana, of Rivers and Plains"
The Guyanese economy exhibited moderate economic growth in recent years and is based largely on agriculture and extractive industries. The economy is heavily dependent upon the export of six commodities - sugar, gold, bauxite, shrimp, timber, and rice - which represent nearly 60% of the country's GDP and are highly susceptible to adverse weather conditions and fluctuations in commodity prices. Guyana's entrance into the Caricom Single Market and Economy (CSME) in January 2006 has broadened the country's export market, primarily in the raw materials sector. Economic recovery since a 2005 flood-related contraction was buoyed by increases in remittances and foreign direct investment in the sugar and rice industries as well as the mining sector. Chronic problems include a shortage of skilled labor and a deficient infrastructure. The government is juggling a sizable external debt against the urgent need for expanded public investment. In March 2007, the Inter-American Development Bank, Guyana's principal donor, canceled Guyana's nearly $470 million debt, equivalent to nearly 48% of GDP, which along with other Highly Indebted Poor Country (HIPC) debt forgiveness brought the debt-to-GDP ratio down from 183% in 2006 to 120% in 2007. Guyana became heavily indebted as a result of the inward-looking, state-led development model pursued in the 1970s and 1980s. Growth slowed in 2009-10 as a result of the world recession. The slowdown in the domestic economy and lower import costs helped to narrow the country's current account deficit, despite generally lower earnings from exports.